As early as June 1940, after French resistance to the Ger­man con­quest of France crumbled, Japan made over­tures to French author­ities for per­mis­sion to sta­tion troops in French Indo­china (now Viet­nam, Laos, and Cam­bodia) and for their war­ships to take up naval sta­tions off north­ern Indo­chinese ports. On this date in 1940 Marshal Philippe Pétain’s Vichy govern­ment agreed to allow the Japa­nese access to three air­fields in the colony, as well as to main­tain a 6,000‑man garri­son. Subse­quently, from their new base in Hanoi the Japa­nese crossed the French Indo­china border and moved north 120 miles into China, a coun­try that had suc­ceeded in stale­mating a war im­posed on them by the Japa­nese in mid-1937. Earlier the governor-general of French Indo­china had sought West­ern help in thwarting Japa­nese designs on his colony, but Great Britain and the U.S., both coun­tries with terri­torial holdings near­by, declined to con­sider mili­tary action. In a rebuke aimed at Japan, Presi­dent Franklin D. Roose­velt’s admin­is­tra­tion did ban U.S. exports of scrap iron and steel to coun­tries outside the West­ern Hem­i­sphere, with the ex­cep­tion of ex­ports to Britain, effec­tive Octo­ber 16. The Japa­nese cor­rectly con­strued the ban to be an act of eco­no­mic war­fare and on Octo­ber 8 declared it an “un­friendly act.” For the Japa­nese, the Septem­ber 22, 1940, agree­ment with Vichy France was the first phy­si­cal chink in the West­ern powers’ pro­tec­tive walls in South­east Asia and the Pacific. In Janu­ary and early May 1941, Japan en­larged the hole using new agree­ments with Pétain. On May 6 Japan and Vichy France signed an agree­ment for eco­no­mic coop­er­a­tion in the French colony, and three days later Japan moved to guaran­tee the in­teg­rity of bor­ders between French Indo­china and its west­ern neigh­bor, Thai­land. Finally, on July 25, 1941, Japan was in a posi­tion to declare Indo­china a Japa­nese pro­tec­torate. Roose­velt retali­ated by freezing $130 mil­lion in Japa­nese assets and banning oil ex­ports to Japan. Other West­ern nations responded with bans and freezes of their own. Roose­velt began rein­forcing mili­tary assets in U.S. Pacific out­posts, un­nerving Tokyo even more, which accused the U.S. of “acting like a cun­ning dra­gon seemingly asleep.” Clearly events portended more dangerous rifts between Japan and the West. 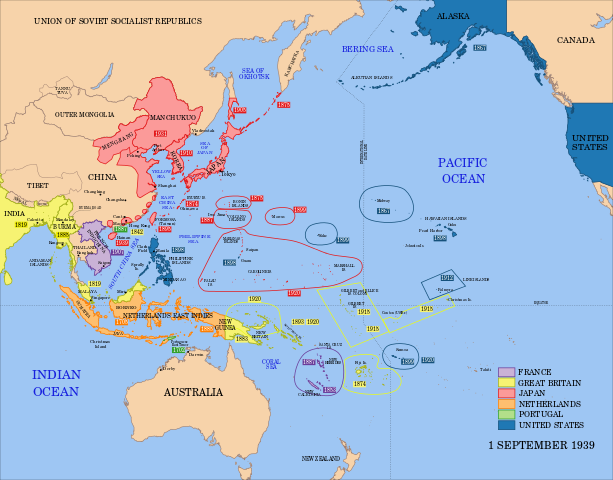 Above: Political map of Japanese, European, and U.S. pos­ses­sions in the Asia Pacific region on the eve of the Pacific War. Japa­nese control in China was tenuous. Left: Like other Western nations, the Japa­nese main­tained a small gar­ri­son of sol­diers in Peking (today’s Bei­jing). On maneu­vers south of the city, the Japa­nese skir­mished with Chi­nese troops on July 8, 1937, in the vicin­ity of the Marco Polo Bridge, 12 miles from Peking. It was an excuse for full-scale war. The Japa­nese quickly seized Peking (July 25–31, 1937) and por­tions of North China, and then advanced rapidly south­ward, placing Shang­hai, South China’s indus­trial and eco­no­mic cen­ter, under siege. Shang­hai was the first of 22 major engage­ments between the Nation­alist Chi­nese under their leader, Chiang Kai-shek, during the Second Sino-Japa­nese War (China’s War of Resistance, 1937–1945). 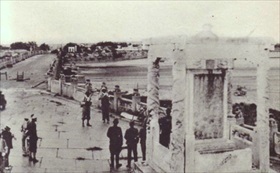 Right: Japanese marines landed north and south of Shang­hai. This picture may have been taken on the Jiangsu coast, which is north of the city. Approximately 200,000 Chi­nese and 70,000 Japa­nese died during the Battle of Shang­hai (August 13 to Novem­ber 26, 1937). After the Nation­alist Chi­nese defense in and around Shang­hai crumbled, the ranking Japa­nese gene­rals punished the enemy by pursuing him all the way to Nan­king, the Nationalist Chinese capital. Left: Since 1932 Shanghai had been a demili­tarized city. The Chi­nese were for­bidden to gar­ri­son the city, though the Japa­nese were per­mitted to main­tain a few units in the city. On the eve of battle Japa­nese marines were head­quartered near a tex­tile mill, enjoying the com­pany of more than eighty emplace­ments and bun­kers of vari­ous types around them. Addi­tionally, the Japa­nese Third Fleet patrolled the rivers that ran through Shang­hai, and the city was well within the firing range of their guns. 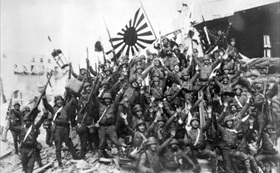 The Japa­nese anti­cipated a short and easy conquest of Shanghai. 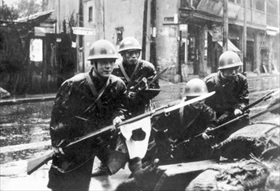 Right: Japanese soldiers wearing gas masks and rub­ber gloves during a chemi­cal attack in a Shang­hai neigh­bor­hood. 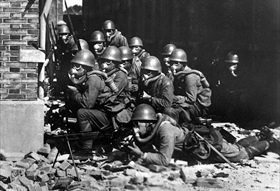 The Japa­nese army fre­quently used chemi­cal wea­pons during their eight-year war in China. Indeed, sol­diers were autho­rized to use chemi­cal weapons on ex­pli­cit order of their com­mander in chief, Emperor Hiro­hito him­self, transmitted by the Impe­ri­al Gene­ral Head­quarters to Japanese commanders in China. 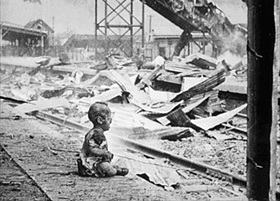 Left: This terrified baby was one of the few human beings left alive in Shang­hai’s South Rail­way Sta­tion after the Japa­nese bombed it on August 28, 1937. Taken a few minutes after the Japa­nese air attack, this black-and-white photo­graph, titled “Bloody Satur­day,” was pub­lished widely in Septem­ber and Octo­ber 1937 and in less than a month had been seen by more than 136 mil­lion viewers. One of the most memor­able war photo­graphs ever pub­lished, the image stimu­lated an out­pouring of West­ern anger against Japanese violence in China. 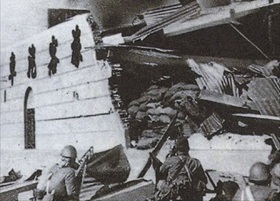 Right: Japanese troops reached the destroyed North Rail­way Sta­tion in down­town Shanghai in Octo­ber 1937. Between 1937 and 1945, the Japa­nese mili­tary fielded 4.1 mil­lion men and en­joyed the ser­vices of 900,000 Chi­nese col­lab­o­rators. Facing the enemy were 5.6 mil­lion Nation­alist and Com­mu­nist Chi­nese soldiers. Of the 1,130,000 Japa­nese sol­diers who died during World War II, 39 per­cent died in China. Over 10 mil­lion Chi­nese died from the effects of the war, with some esti­mates of actual deaths running twice as high.